A Soft Spot In Philly For Donovan McNabb : Tell Me More NPR’s Brakkton Booker was on hand in Philadelphia Sunday for one of the most anticipated moments in sports – the return of NFL star Donovan McNabb, as a Washington Redskin, to his old turf to face off against his former team, the Philadelphia Eagles. Tell Me More Producer Brakkton Booker, here. That was the question the national media asked fans of the Philadelphia Eagles prior to Sunday's game against the Washington Redskins. The NFL's storyline of Redskins’ quarterback Donovan McNabb's return to Philly transcended the sports world into the national mainstream media. Virtually everyone was speculating how McNabb would be received when he took the field for the first time as a visitor. The topic was even tossed around in Friday's Tell Me More Barbershop roundtable. On the surface, this game had too many story lines to count. 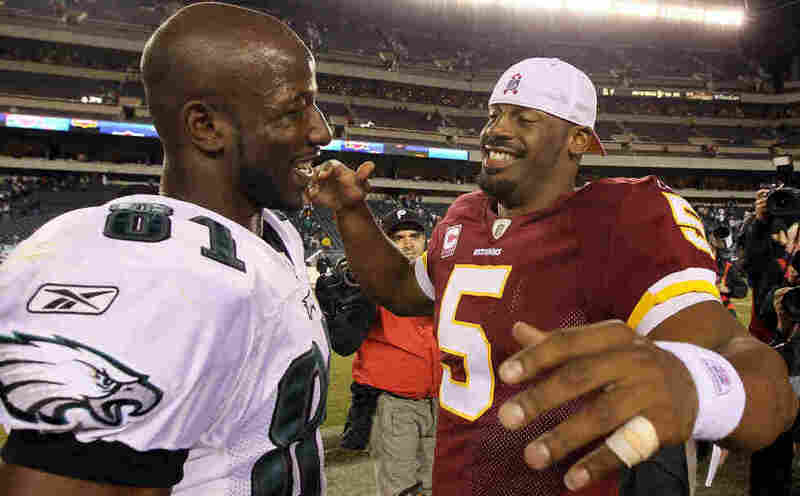 The most prominent one, of course, was about McNabb trying to exact revenge on a team – one that he loved playing for and wanted to end his career with – that shockingly shipped him to a rival team over the Easter weekend because they thought he was too washed up. Underneath the narrative of McNabb's return were the undercurrents of race that seemed to haunt him, but were never really discussed in the media in any meaningful way during his 11 years with the Eagles. Now let's be honest, race typically doesn't rear its ugly head that often in professional sports these days. I mean, after all, teams want to put the best players, no matter what color their skin is, on the field -- or the court, or the ice -- to win games. But things just appeared to be a little different when it came to McNabb in Philadelphia. He was drafted to Philly in 1999 as the second overall pick. Typically in the NFL, when you draft a player as high as McNabb, you expect him to be your franchise quarterback. This makes fans, in most cases, ecstatic. But Philly fans booed the selection. No, I'm not saying that fans booed because McNabb is black. In fact, they weren’t unaccustomed to a black quarterback. The team rolled with Randall Cunningham, also African-American, in the mid-1980s through the mid-1990s. Still, McNabb was booed before even taking a snap in a game or even participating in a practice to that point. And who can forget the harsh comments conservative commentator Rush Limbaugh made about McNabb in 2003, back when Limbaugh was an NFL analyst for ESPN: "Sorry to say this, I don't think he's been that good from the get-go," Limbaugh said. "I think what we've had here is a little social concern in the NFL. The media has been very desirous that a black quarterback do well. There is a little hope invested in McNabb, and he got a lot of credit for the performance of this team that he didn't deserve. The defense carried this team." Add into the mix that he was selected to six Pro Bowls (2000-2004, 2009), where he led his team to five straight championship games (2001-2004), and lost by just three points in 2005. He never seemed to shoulder an unfair portion of the blame for the teams losses, but received less than enough credit for his team’s successes. Throughout McNabb's stint in Philly, there were complaints about his accuracy throwing the ball. Critics said he scrambled too much and wasn't a pocket passer (these types of critiques somehow tend to find themselves attached to African-American quarterbacks) and that he couldn't win the "big game." Maybe some of that is true, maybe not. Maybe that's the slightly veiled race issue poking out. Maybe not. But it does make you wonder. And all of this is why I had to be in Philadelphia when McNabb returned as the quarterback of the hated Washington Redskins. I had to see if they were going to boo the man that once threw four touchdowns in a game (on a broken ankle). I wondered, would they boo the all-time leader in Eagles wins, who holds the record for most passing yards and most passing touchdowns in Eagles history? Alas, the moment finally was upon the fans of Philadelphia Sunday afternoon. McNabb ran onto their field in the opposing team’s uniform. At that moment, I fully expected hear a healthy chorus of boos (peppered with some choice expletives). I was already prepared to be angry at the same legion of fans that infamously booed Santa Claus at a game back in 1968. But to my surprise, McNabb was greeted with cheers -- a standing ovation, no less. And so I was very proud of Philadelphia … and happy for McNabb, as well. Perhaps the fans in some ways were thanking him for helping to resurrect Michael Vick (who is also black) to the Eagles -- someone who, quite possibly, could be McNabb's football star successor in Philly for years to come. Whatever the case may be, the overwhelming support showed that Eagles fans were still appreciative of Donovan McNabb and his accomplishments there. But once the game got underway, the boo-birds began to cry out when the Redskins offense took the field. But I’m fine with that. That’s the way the city of brotherly love is supposed to welcome its opponents.